As everyone who has driven a vehicle recently knows, traffic volumes are up and congestion is worse today than just a couple years ago. I know I see and feel it driving around the state for presentations over the past year. While the increases have been particularly strong here in the Willamette Valley, it has a statewide impact. One reason is that goods produced and shipped from around the state generally travel to the Valley and through Portland on their way to their final destination. So even if traffic and congestion may not be quite as bad elsewhere in the state, it still impacts the regional economy. To put some numbers to the increased traffic volumes, total vehicle miles traveled across the state has increased about 10 percent in recent years. This increase followed a decade where total traffic volumes were flat or declining. With jobs plentiful and fuel prices low people are driving again and as Oregon attracts more people from other states this leads to additional fuel consumption and DMV transaction volumes. In the past year or so, Dan Porter has been promoted to the head forecasting position over at ODOT. He’s been doing some really great work and his revamped forecast document is full of interesting nuggets of information. Our office loves ODOT data because it’s somewhat economic in nature, it is impacted by longer-run demographics and shifts in consumer demand. Dan’s work also feeds into some of the Highway Cost Allocation Study which our office oversees each biennium. If interested in learning more about the different trends impacting the state’s overall transportation system — from weight mile taxes to DMV work loads — I highly suggest you read the forecast. One aspect of traffic that has really changed over the past 15 years or so is driving behavior. Even as the state’s population continues to increase, for much of that time period total traffic volumes were flat. On an individual basis we were and are driving considerably less than we were historically. Based on the data, it’s clear that prices matter. As gas prices increased during the mid-2000s, driving behavior shifted down and remained low throughout the Great Recession and its aftermath. However now that prices are low again — and they’re up y/y today but still low relative to the past 10 years — driving has made a rebound. That said, VMT per adult remains considerably lower today than last decade even with the rebound in recent years. For more on VMT trends, see our office’s previous work. What’s really interesting is trying to figure out what are driving these behavioral changes. Some is economic — household incomes, gas prices, etc — some is due to things like urban form, but some is societal and even generational. One key trend has been that fewer and fewer teenagers were getting their licenses and driving relative to previous generations. To what extent are these trends expected to continue, and how much of this shift is a life-cycle vs generational change? There are a number of national studies that dive into this. The general consensus expects most of these shifts to be, more or less, permanent. We know teenagers today don’t go cruising around town like they used it. They’re much more plugged into online activities (gaming, social media, etc) which doesn’t require actually driving from place to place. That said, some of it clearly is cyclical. 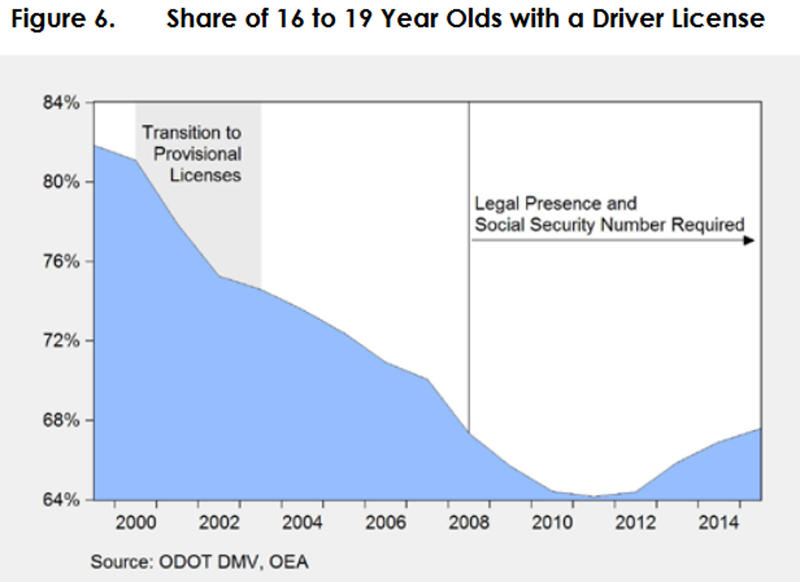 In fact here in Oregon we’re seeing the number of teenagers getting a license increase again. Here is Dan’s chart from the forecast document. As Dan annotates, policy changes clearly impact these figures over time, but the numbers are still picking up. Like I mentioned, our office finds the ODOT data fascinating. In the future I plan on borrowing and highlighting some more of Dan’s work, along with some of the research that goes into the Highway Cost Allocation Study. In the meantime, I would direct you to a couple of informative posts over at City Observatory. The first discusses the fact that with the increase in driving, we’re also seeing an increase in traffic deaths — unfortunately the two go hand in hand. The second digs into the methodology underlying some of the congestion “studies” you may see pop up in the news from time to time. 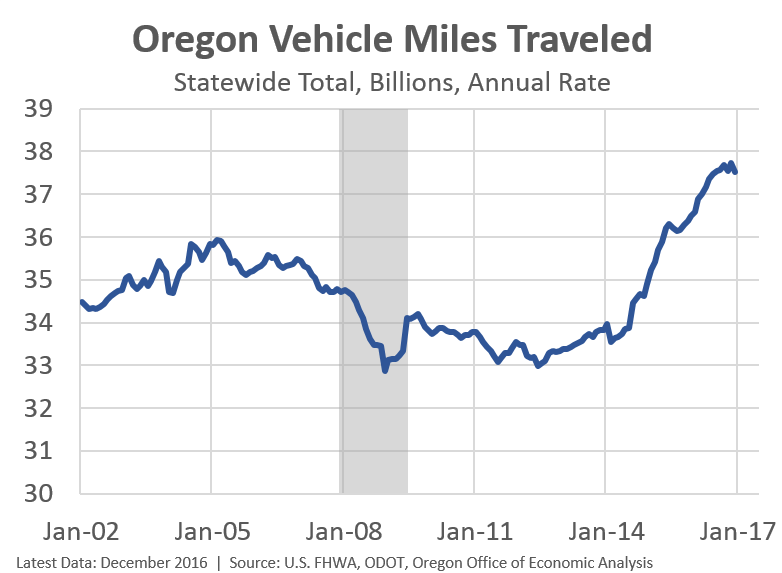 While the “VMT per adult” rate is calculated using Oregon’s resident population, the miles driven include those driven by tourists and long-haul truckers who are not Oregon residents, and the rise and fall of those miles are closely linked to fuel costs. It would be interesting to see fuel costs charted on the same graphs. I also wonder about the exclusion of children from the rate calculation. Those kids are not driving, but they do help “drive” the rate upwards, as evidenced by the “mini-rush-hour” that occurs on weekday afternoons in the vicinity of schools, particularly in districts which do not routinely provide daily transportation to most students. Thanks Bill. In the first City Observatory link there is a US chart with prices included. That’s clearly a big part of what’s going on. Prices matter! (It’s nice when economists can back things up with real world data) As for the kids, or any other demographic adjustments, those don’t really impact the shape of the graph very much. It just makes the y axis bigger or smaller. I like the adult population (or 16 plus), but at times cut it off at 85 years old given the decline of driving as we age. But overall demographics are stable year to year. They’re only impacted by long-run trends. The school age population doesn’t change much in any given year, although it ebbs and flows a bit based on the size of generations. all of these charts are misleading because they don’t have a Y axis value of 0 at the bottom. The urge to contextualize the data is a good one, but context does not come from empty vertical space reaching down to zero, a number which does not even occur in a good many data sets. Instead, for context, show more data horizontally! .